As the largest Chinatown in Vietnam, Ho Chi Minh City's Chinatown, (also known as Cholon, meaning "big market"), is where most of the Chinese inhabitants of the city live. Originally the city of Tai-Ngon, it was settled when the Hoa, the Chinese minority in Vietnam, fled from the Tay Son forces. The name Tai-Ngon literally means "embankment" in Cantonese, which is what the inhabitants built to defend themselves. The Tay Son dynasty eventually was overthrown, and the embankments were no longer needed. In 1879, it was first pronounced a city by the Governor of South Vietnam during the French colonial period. It gradually merged with Ho Chi Minh City as the cities got bigger, becoming Saigon-Cholon in 1931. In 1956, the Republic of Vietnam dropped the "Cholon", and the city became known as Saigon once again. Today, Cholon is home to most of the Chinese population of Ho Chi Minh City, and as a result, Chinese culture is much more prominent there, including Chinese shops and Taoist and Buddhist temples. Although the inhabitants of Cholon come from many different areas of China, the most common dialect is Cantonese. The area subsequently attracts mainly Chinese and Taiwanese tourists. 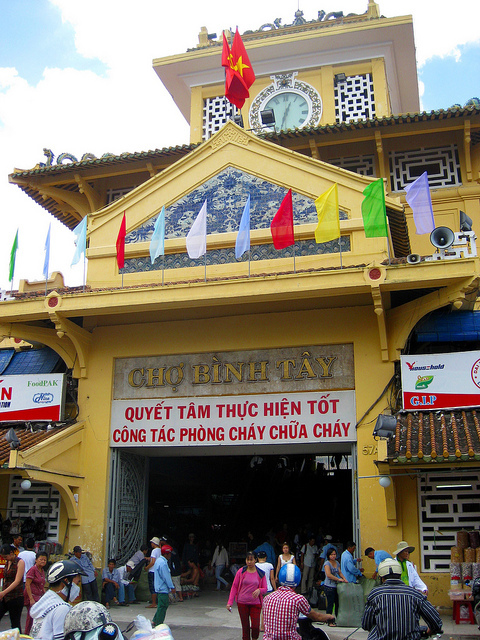 There is one market in Chinatown, Binh Tay market, which is the largest market in Ho Chi Minh City. Like Ben Thanh market, it also attracts tourists, but not quite as many, which also means that the vendors don’t speak english as well as their counterparts in Ben Thanh market. The main difference between the two markets is that most of the sellers in Binh Tay market are wholesalers, and will not try to chase down individual customers. However, this also means that bargaining is quite a bit harder as they aren’t as desperate for sales as the Ben Thanh market sellers as they have consistent local buyers.